Audi’s roots date back to 1910, when August Horch used the Latin translation of his last name to coin his company “Audiwerke GmbHâ€. Since then, the car manufacturer has been ahead of its time in innovative technology and ultimate efficiency. Oh, and don’t forget incredible performance as well. Which is why it may be surprising that they waited until 2006 to release their first SUV, the Q7. As impatient as we are, we think the wait was worth it. Now in its third year, the 2008 Audi Q7 is a purposeful blending of drive quality and uncompromised practicality, something that is evidenced by its all-wheel drive, five-star crash ratings and technologically advanced safety features. We think the sum of this SUV’s parts, including the 3.2-liter V-6 and 4.2-liter V-8 engines, would make Herr Horsh very proud. A 6,000-pound towing capacity and optional three rows of seats give the Q7 utility beyond other SUVs in its class. The interior lives up to luxury class standards with standard leather seats and an impressive base audio system. The Q7 suffers from a 5,000-pound weight problem, and, if you like to really put your foot down, the V-6 won't have enough power for you. The next logical step is a financially burdensome $16,000 jump to the $58,600 V-8. Fuel economy is poor for both engines, even compared to gas-gulping competitors in its class. The V-6 will offer plenty of power for those tooling about town. With its 280 horses, the smaller of the two engines navigates potholed suburban roads and smooth highway lanes with ease. The V-8, however, has an additional 70 ponies and an extra liter of displacement, shaving off over a second from the V-6’s 8.2-second 0-60 mph time, to hit 7.1, making it faster than the 7.5-second Porsche Cayenne. For all the power under the hood, it takes a second or two for the engine to respond when mashing the gas. This acceleration lag makes freeway passing an issue, and even a more responsive sport mode doesn’t completely eliminate the problem. To help soften up the somewhat stiff ride, we highly recommend opting for the adaptive air suspension. The $2,900 option, only available on the V-8 model, provides a choice of five air suspension and damping levels from comfort to dynamic, smoothing out your daily commute or noticeably improving responsiveness during spirited driving. The Q7 comes with two engine options: a 3.2-liter V-6 with 280 horsepower and 266 lb-ft of torque or a 4.2-liter V-8, producing 350 horsepower and 325 lb-ft of torque. Power is sent to the wheels through a 6-speed automatic transmission with Tiptronic manual mode and paddle shifters. Audi's Quattro all-wheel drive system is optional for the V-6 and standard on the V-8. Though the base stereo will be plenty for some, the $6,300, 14 speaker, 1,000-watt Bang & Olufsen audio system, also found in the A8, takes music to a new stratosphere. For $1,850, a 5.6-foot, three-panel panorama sunroof is an accessory that can't be found on any SUVs in its class and gives even the third row occupants a sky view. If an Alcantara roofliner is more your speed, that too is an option for $1,550. Small, but practical features can be found throughout the cabin. At a touch of a button, the Q7’s tailgate lowers 2.8 inches to a 30-inch height for easy loading. And just in case the LA River overflows, the Q7 can ford through 20 inches of water. Lane assist detects whether the car is drifting over the lane markers through a rearview mirror-mounted camera. The steering wheel vibrates to alert the driver of the drifting car, a response far less annoying than those systems that use audible alerts, like the Infiniti FX's lane departure warning. Audi's side assist, another advanced safety system and the first of its kind, illuminates a yellow LED on the side mirror when a car is approaching or already in the Q7's blind spot. The lights brighten and flash if the driver engages the turn indicator. This safety feature allows us to avoid the near misses we've all had in the past while changing lanes, and both systems are available with the $1,750 technology package. If you can’t say anything nice, don’t say anything at all. We wish this were the case with this LEV-II SUV. At 14 mpg in the city and 20 on the highway, the V-6 is on par with others in its overindulgent class. But the V-8 tops the naughty list at 12 mpg in the city and just 17 mpg on the highway - worse than the Hummer H3, which gets a paltry 14 city and 18 highway. When you realize the Q7 takes premium gas, those four-dollar-plus gas prices will really start to hit home. The compelling and elegant interior is clinical in its perfection. Between the gauges is an information center containing everything from your current radio station to the tire pressure. While the navigation system is easy to master, its controls are next to the shifter, and their unusual location means looking away from the wheel to find the correct button. The Q7 is built on a modified version of the Volkswagen Touareg and Porsche Cayenne platform, but it has been lengthened by more than a foot to accommodate the extra row of seats. The four-ringed Audi badge gleams inside the aggressive and foreboding signature front grille, and the styling, while not revolutionary, is polished and reminiscent of others in the Audi lineup. Its three trims range from $42,500 for the V-6, $48,350 for the V-6 Premium, which adds features like a rearview camera and heated front seats, and $58,600 for the V-8. Optioning can get a little out of hand though, and your V-8 equipped Q7 Premium with an S Line package can easily hit $68,000. These prices are on the high side compared to direct competitors like the BMW X5, Mercedes-Benz M-class, Infiniti FX, Acura MDX, Porsche Cayenne and Cadillac SRX. 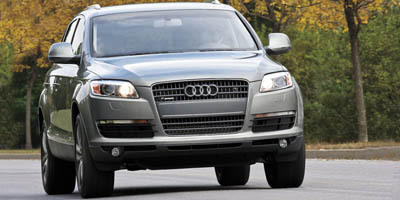 Besides needing a stint on the Atkins diet, the 2008 Audi Q7 is a functional people carrier. Though the drive isn’t as dynamic as we would have hoped from Audi, the large array of features aimed toward comfort and safety, proves you can trust this SUV to carry your most precious cargo: your family.